Justinian I, Roman Emperor based in Constantinople from 527 to 565, took control of what was left of the Empire in Europe and parts of Italy, and involved himself in a zealous campaign of church building. This city in northern Italy, near the Adriatic and just south of Venice, has uncertain origins. It is possible the Etruscans were here - there are pieces of evidence, though inconclusive. Possibly, the Umbrians were here. They occupied Rimini to the south, and pushed northwards to the River Po. The Romans visited the port of Ravenna in 82 B.C., and Julius Caesar chose Ravenna as his headquarters for a time. The Emperor Augustus developed a port in an area known as Classe, harboring 250 ships. Surrounded by marshes on the west and the Adriatic to the east, Ravenna, interestingly, had no drinking water. At the beginning of the 2nd century, A.D. Trajan built the city an aqueduct. The city prospered, and became the capital of the Western Roman Empire for about the first 75 years of the 5th century, under the Emperor Honorius. Justinian's influence entered the scene when his General Belisarius took control of the city from the Goths in 540. There had been Arian peoples, who were Christians following the teachings of Arius, maintaining Christ was God by adoption, and not by nature. Considered heretics by Catholics, the Arians nevertheless lived side by side with Catholics for a while. In 554, Ravenna became the seat of the Prefecture (Head of State) of Italy, and shortly afterwards Justinian gave the Catholics all the lands of the Arians. We are going to look at two major yet very different churches, which were supposedly built under Justinian's direction here. The first, San Vitale, was thought to have been built by Justinian to commemorate his recovery of the city under Roman rule. According to the people of Ravenna, Justinian never stepped foot in the city, though his interest and influence was quite strong. 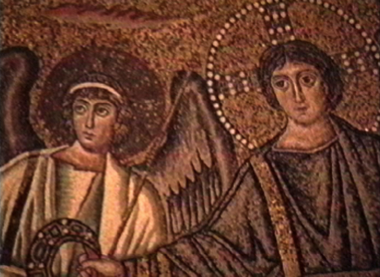 Historians write that Justinian founded San Vitale to commemorate his recovery of Ravenna. As usual, a little bit of research almost invariably uncovers some discrepancy in hitherto historical "facts." According to seemingly knowledgeable writings published within the city itself, it seems the church was begun prior to Justinian's control. Consider the date listed above: Belisarius not arriving until 540. The church was begun in 526. It was completed in about 547, possibly 548, so there was time for the creation and insertion of mosaic tile murals depicting Justinian and his Empress Theodora. The church was dedicated to the martyr Saint Vitale, and he is depicted in the apse, receiving the crown of eternal glory from Christ. 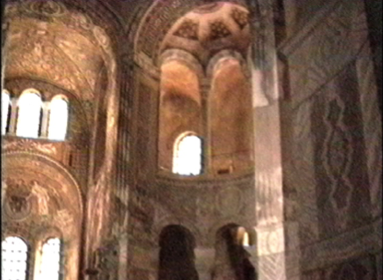 That apse is done totally in mosaic tiles, each the size of a thumbnail. 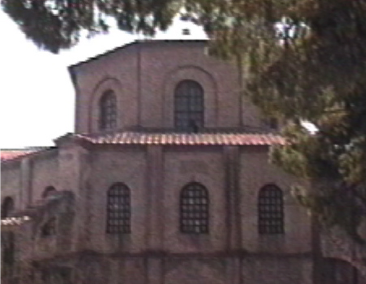 It is possible, of course, for Justinian to have finished the church with those commemorative thoughts of thanks in mind and a formal dedication might have followed in that vein. In any event - you are welcome to explore this latest discrepancy. San Vitale is designed as a "central" plan, in this case an octagon, as opposed to the basilica type, which was a long rectangular crucifix. 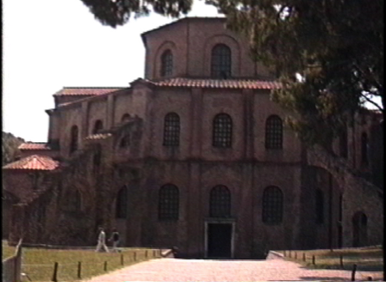 Hagia Sophia was basically a central plan, although two half domes elongated the central dome space. 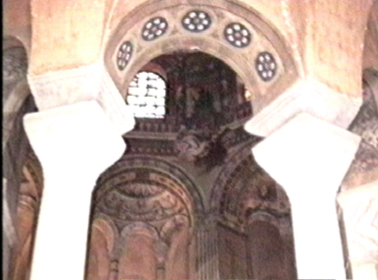 Here the central octagon is contained within an octagonal ambulatory. Entering the church, the eight columns or piers (piers are extra-heavy columns) dominate, as they rise towards the dome above. There is a second level, the so-called gallery level, which was used by women, and is called a matroneum. I have always suspected that the early Christians might have followed the Judaic traditional of separating men and women in religious structures. An interested student could certainly pursue this question. Again, local publications in Ravenna do bring this up, yet historical texts ignore the actual function of what is later to be known as a "triforium gallery" in Romanesque and Gothic churches. The central dome is supported by squinches, arched variations of the spherical pendentive. The dome was created with a double series of tube-like clay pots fitted into each other in ever-smaller circles, providing depth but with minimal weight. Reducing weight on the exterior walls enabled the dome to avoid the necessity experienced in Constantinople - that of providing heavy buttressing to contain heavy forces. The dome was then covered with timber construction to protect it from rain. This was a deviation from all earlier Roman domes (masonry domes are not easy to waterproof). Always trying to bring the past into the present, we will digress here for a moment and discuss Eero Saarinen's dome on the Kresge Auditorium, built between 1952 and 1955 on the M.I.T. campus in Cambridge, Massachusetts. The structural concept is called thin-shelled concrete (think of an egg and its shell - thin and light, yet durable to some degree). At its inception, the apex of the dome was 7.62 centimeters thick (3"). It was undoubtedly sealed to make it waterproof, but it leaked and leaked and leaked. Building in cold climates with exposed concrete is a problem, even with basic sealers. The slightest crack allows water to penetrate, that water then freezes in winter, which causes expanded cracking. The last report I read on the dome was that it was layered to a depth of a third of a meter (12"). 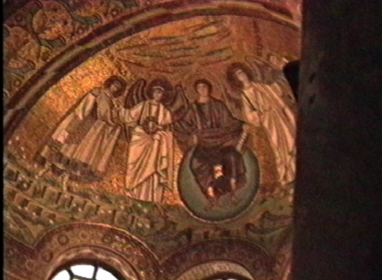 Back in Ravenna, the influences throughout the church are Byzantine. From richly grained book-match marbles to mosaic tile depictions of various biblical and historical figures. Remember the notion of things "busy" being Byzantine. However, these busy things are invariably beautiful, and enliven the architecture through their integrated design. Notice the impost or stilt blocks over the capitals. 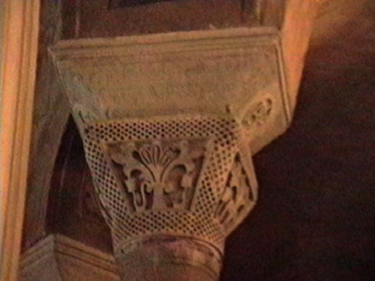 The capitals are lace-like, with openwork carving. The stilt blocks in turn are richly carved, with bas-relief sculptures. Walls, floors, columns, and the dome are all richly detailed. 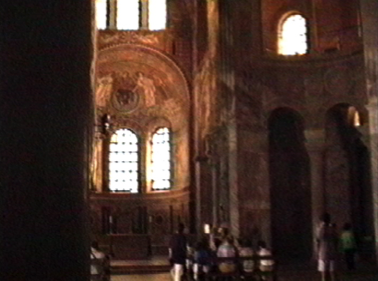 The Emperor Justinian is shown seated across from his wife Theodora, on either side of the apse (straight ahead). Clerestory windows on the exterior bring light into the church, and through the arches of the eight pier supports of the dome. The architecture is multi-layered and transparent, in that the inner walls allow light to pass through their arched openings. In addition, that light causes the gilded mosaic tiles to shimmer. It's a common Byzantine effect, which we will see in particular in the church of San Marco in Venice. That shimmering, of course, adds infinitely to the spirituality of the building, in that the walls seem to exude an aura of glowing brilliance. There is, in essence, a symphony of forms, colors, textures, and materials in harmony with one another, perfectly integrated with the architecture. What is perhaps extraordinary, is the quality of the building itself. It appears to be almost new. This was one of the oldest and completely intact working buildings I had ever seen, and its condition totally belies its nearly 1,500 year age. 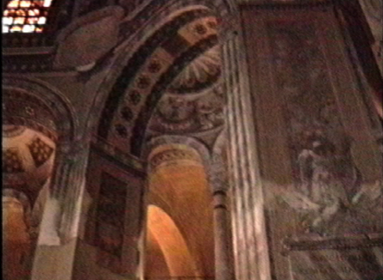 What added to the experience of being inside San Vitale was a choir rehearsing in a side chamber, their tones reverberating majestically throughout the church. One thing you should note: Though a number of church plans will be described as having central spaces, you have to realize that the altar was rarely, if ever, placed in the center; it is invariably off to an end opposite the front door, thus perhaps belying the centrality of the space. Otherwise, the church functions would have had a "theatre-in-the-round" aspect to them. The dimensions quickly: the inner octagon has a diameter of 16.7 meters (54'-9"); the outer octagon is 35 meters wide (115'). The dome itself rises to a height of 30 meters (90'-5"). Understand we're talking about something approaching the height of an eight-story building constructed, as I stated, almost 1,500 years ago. It appears to be in perfect condition to this day. I don't know how much maintenance has been involved, or the extent, if any, of repairs or reconstruction. There is no indication of either such, nor any reports on this. It is just magnificent, and should set an object lesson for anyone getting into the construction trades. The historian of Ravenna, Andrea Agnello, writing in the 9th century said: "no other temple in Italy could be compared with it." 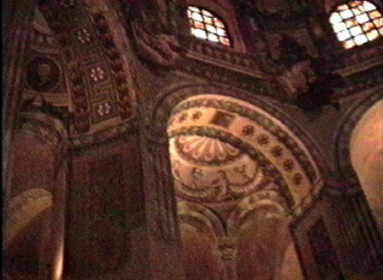 The architecture of San Vitale was comprised of a whole range of technical knowledge regarding construction and stability, the structural forms used, and an integration of meaningful decorative effects. Build them well and they will last!